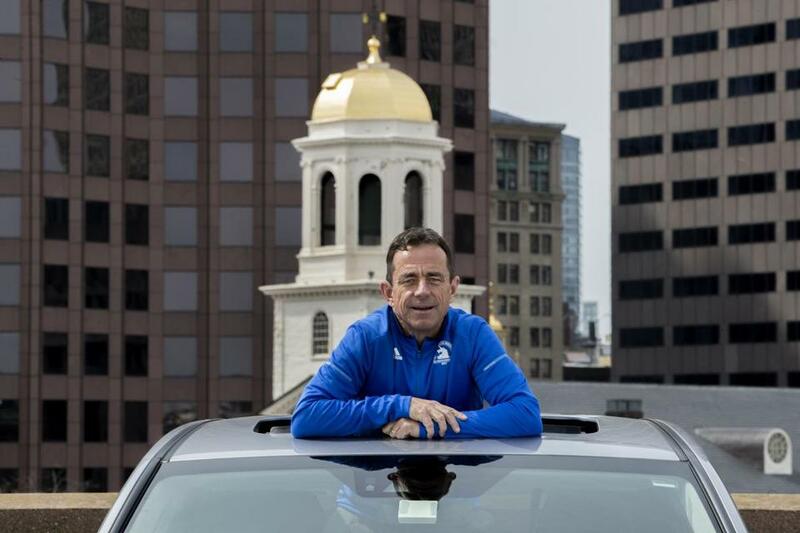 Boston Marathon race director Dave McGillivray, 62, has run more than 150,000 miles and 145 marathons, including the last 44 Boston Marathons. He has finished last in his own race 29 straight years, waiting for everyone else to run before he starts. This year he’ll run again, to raise money for the Martin Richard Foundation, in honor of the 8-year-old boy who was killed in the 2013 Marathon bombings. On this day he’s already been up since 2:30 a.m.
“I like to get all my work done before most people even wake up,” he says. Driving from his North Andover home to Boston in his 2017 Acura MDX, he is a positive force, energetic and prone to taking one hand off the steering wheel to punctuate a point. “Kids [ask] what’s your best accomplishment. I say it’s my next one,” he said. “I want to take this rearview mirror and throw it out, ’cause I don’t want to look behind me. I want to look ahead. Q: In 1978 you ran from Oregon to Fenway Park for the Jimmy Fund. Two years later you ran from Winter Haven, Fla., to Boston. You’ve biked 24 hours straight. Swam for 24 hours straight. Ran up the Empire State Building and done nine Hawaiian Ironman triathlons. Next year you’re planning to run seven marathons on seven continents in seven days for MR8 [Martin Richard Foundation]. You were diagnosed in the fall of 2013 with severe coronary artery disease. Are you crazy? A: I guess everyone has a perspective on that. I don’t consider it being crazy. I consider it a part of my DNA. That’s what I do. Everyone has a right to challenge themselves in their own way. If someone’s doing it on a barroom bet, I think they’re crazy. If someone is legitimate about their goals and they earned the right to do it legitimately, then I don’t consider that crazy. Q: You’ve raised several million dollars for various charities, right? That should be applauded. A: The reason why I combined philanthropy with my goals is that gives it a purpose instead of just being a personal thing. My motto is set goals, not limits. Q: So as race director, what do you do? A: It’s changed over the years. I actually consider myself more now as a conductor than a director. If they had a title of race conductor that would be it, because when you look at someone like Keith Lockhart or Arthur Fiedler, they’re not playing the tuba or the violin; they’re making sure everyone is working together harmoniously. Q: How hands-on are you? Are you the guy who orders the 1,000 portable toilets or the 108,000 safety pins? A: No, I used to, but what I’ll do now is I’ll review it all. The BAA has a staff of about 25 people, and they handle the majority of that upfront work and planning. My focus is more when the rubber hits the road. Q: What happens to all the warm-up gear that gets tossed off leaving Hopkinton? A: It all gets donated to local charities, particularly the Boys & Girls Club. Q: You and I have different philosophies. Mine is never run unless someone is chasing you. So why do you run? A: That’s changed over the years. I started running by default. It wasn’t my initial chosen area of athletic endeavor. Because of my short stature [5 feet 4 inches], every time my friends bucked up the sides in the park I was the last pick. They picked the girls over me, so that was devastating for a young boy who wanted to play second base for the Red Sox or guard for the Celtics. Q: We’ve got short guys doing that now. A: Yeah, but short is not 5-4. I get a kick out of Tommy Heinsohn [saying], “Awww, give it to the little guy.” [Isaiah Thomas is 5-9], that’s big to me. You’re not 5-4, and that’s a big difference. I didn’t have a physical illness or a mental illness. I had an emotional one. It’s called rejection, so I started running because no one can cut you from running. Q: So how do you run without suffering? I don’t get endorphins; I get blisters, rashes, and cramps. Is it a painful process? A: Well, it’s certainly not totally pain-free. I have a little bit of a philosophy. I’m not trying to beat myself up. But there are certain benefits from experiencing pain. I wrote an article once entitled “Pain is Good.” But it’s all how you manage it and what is the purpose of the pain. It’s the “No pain, no gain” philosophy, where in order to get stronger, sometimes you have to suffer a little bit physiologically for the body to respond to get stronger. 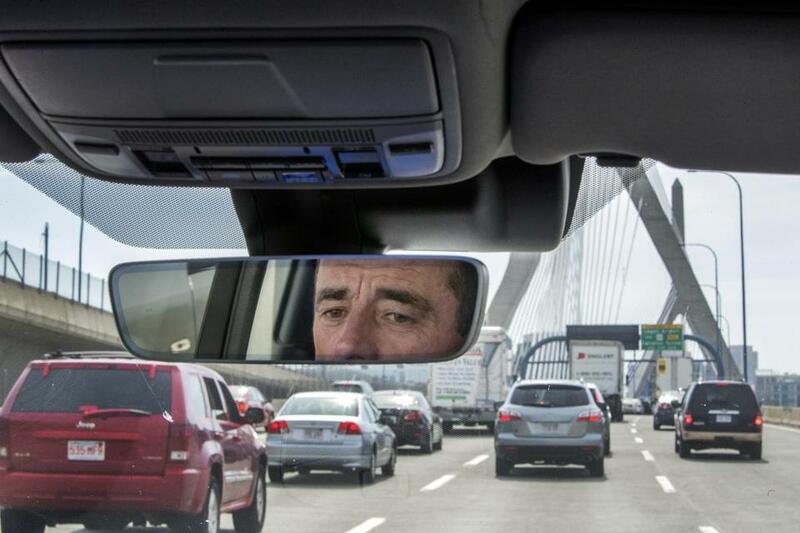 Q: Did you have any close calls on your cross-country journeys? A: Oh, plenty. It’s a game of inches out there. Knock on wood I never got hit. Q: Do you ever think we’ll see a sub two-hour marathon? A: Well, they’re training for that now. They’re preparing for it. There are three athletes that Nike is actually doing this project with in Italy. They’re doing everything as far as studying physiologically putting these athletes through the drill. They will go on a pace of under one hour for the first half, and hopefully they can bring one of the three through in under two hours. Will it happen? All the stars would have to line up. Q: It’s like a Roger Bannister-type moment? A: It is, but you’ve got to do it for two hours. The pace is 4:40 something per mile. Can it be done in a normal staged race? Never say never, but I don’t think you will see it in my lifetime. Geoffrey Mutai of Kenya ran a 2:03:02 here back in 2011. But three minutes to trim is still a long time. Q: How come the elite runners can’t listen to music? A: It’s a USA Track and Field rule, we don’t impose it. But I think it stems from years and years ago. They felt that some athletes were getting information from coaches along the course. Q: What are your five greatest running songs? A: I don’t have them, because I run with my voice recorder and I don’t listen to music when I’m running. I get all my best thoughts when I’m out on the road. Q: You’re talking the whole time? A: Not the whole time. I’m thinking the whole time. I’m old school. I’m always working. Q: The FBI recently retrieved Tom Brady’s stolen Super Bowl jersey. What if you offered amnesty to Rosie Ruiz, reclaimed her medal, and then auctioned it to benefit the Martin Richard Foundation? A: Well, first of all, it would have to be a collective decision; it wouldn’t just be my call. It would have to be an organizational decision. I don’t know that the Richards would buy into that, either. I believe in second chances, but only if the individual comes clean and truly is sorry for their misgivings. We all make mistakes. My sense is [Ruiz] probably didn’t mean to win the race, so she made a critical mistake. But once she did it, it was deny, deny, deny, and the cover-up is always worse than the crime. And I think for that reason alone, I probably wouldn’t do it. Q: What if Adidas offers to pay $10 million for the naming rights to the Boston Marathon, would you do it? The Adidas Boston Marathon. A: Again, not my call, cause I’m the road cone guy; I’m not the head of marketing. Q: Are you for it or against it? A: Well, the money is needed and could be used in a positive manner. I’m OK with that, personally. Q: There are a lot of purists who would be ⅝upset. A: I understand. But it’s a business, too. You’ve got a business to run. Q: What about Galen Rupp? Do you think he’s the best American hope? A: Yeah, on paper he is. That’s why we run the race. Boston can be a very unforgiving course, and to run it well you have to know it. That’s my big question about Galen. [Former Boston winner] Alberto [Salazar] is his coach and he obviously knows it. But it’s not just knowing it. It’s running it. Q: Last year, there was only one American man and woman in the top-10 finishers, which were made up of almost exclusively Kenyan and Ethiopian runners. They are absolutely amazing marathoners, but don’t you think fans yearn for 2017 versions of Bill Rodgers and Joan Benoit? A: I think so. Yeah, why wouldn’t you? Hometown favorites. But I don’t think that lowers their respect for what these athletes are accomplishing out there. Q: Why are the African runners faster than the locals? A: It’s a priority over there. It’s a focus. They grow up with it. Here there are a lot of other opportunities in the United States for athleticism. Q: Was it hotly debated whether the race would be run in 2012 when the temperatures reached 87 degrees? It’s never been postponed, right? A: No, but it’s been discussed. We had a tough call. Do we fire the gun or not? Because if you don’t fire the [starter’s] gun, nobody gets hurt. 61 percent of the people that do this race are first-timers. They come from all over the world, 99 countries. You don’t want to hurt anybody. We ramped up all our assets, from water and ice and misting tents, but still was that enough to get all these people through that inferno? Later on that night when I went out and ran, [I saw] all these bottles and popsicle sticks, which were a sign that the fans went into stores and bought things for the runners. They came up big. They’re the ones that were the heroes of the race. Q: And do you think it came out too early? A: For some, perhaps. For others, maybe not. There are some who are profoundly impacted by the events of that day, but they have a choice. They can choose not to see it. Q: Why did you see it? A: I saw it initially because I was invited to come to critique it for its authenticity. Q: [Mark] Wahlberg, who has been very good to inner-city kids, tried to get it right, but . . .
A: It’s a Hollywood movie and not a documentary, so I think under the circumstances they probably did the best they could do with it. Q: Did you run the course in 2013? A: Eleven days later I went back out to the start and ran it. I felt I needed some closure for me, but I wanted to wait, out of respect for everybody. It wasn’t physically difficult, it was emotionally difficult. Q: What about after the bombings, did that stress cause you to have coronary heart disease? A: It was a combination of a lot of things. I broke a lot of rules. I thought if the furnace is hot enough, it will burn. A lot of it is self-inflicted. Since that day, almost 3½ years, I haven’t had a cookie, a potato chip, a beer, alcohol, a soda, sugar, I totally changed my diet. I changed my sleep habits. Q: Are you still running a mile for every birthday you have? What are you going to do when you’re 100? A: Yeah. My game, my rules. I’ll change the rules. I’ll move that many miles but I’ll probably make it a [running and biking] combination. Q: What is it like to run the Marathon last? A: I get a lot of catcalls from people. Like, “Pick it up, you slug” or, “The old-man van went by three hours ago,” or, “Why don’t you train for this thing?” I mean, these are just people who have been drinking all day. Q: You don’t get the full experience of Boston? A: That’s my little trick. I experience everything throughout the day on the motor scooter — I’m with the men’s leader for the whole race, so it’s embedded in my head. I’m still seeing the crowd, feeling that buzz and that vibe. So when I run eight hours later, it’s still there, even though it’s the calm after the storm. I like the serenity of it being over, that we did a good job and now it’s my turn to bring up the rear. There’s something special about all of that.